It’s encouraging to know that as Return to the Forbidden Planet makes its intergalactic week-long petrol stop at Glasgow’s King’s Theatre it is gaining curiosity from those who were still dust in the Milky Way when the cult musical was conceived 25 years ago by Bob Carlton. This Olivier Award winning show is mostly known for having a dedicated group of sci-fi followers who have watched the wacky musical, which is reminiscent of a tame The Rocky Horror Picture Show, on repeat. Hence, these experts will not feel startled in the slightest compared to us amateur spacemen/women when we are instructed to put our hands on our cranium, pump them up and down and explode all before the show starts, which we will later learn is an aircraft procedure commonly known as the polarity reversal. 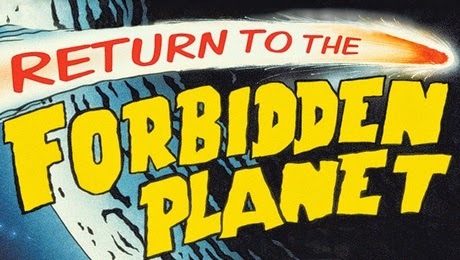 Carlton adapted the flamboyant sci-fi B-movie Forbidden Planet (1956), which was in itself influenced by Shakespeare’s The Tempest, to the stage by throwing in a few of the greatest anthems of the 50s and 60s to make it the first West End show created for a cast of live-musicians. This is a musical which claims to “not take itself too seriously” and it does exactly that by focusing on cheesy sci-fi spoofs, including a tin robot called Ariel, played by Joseph Mann, who has a coke advertisement attached to his chest, and also over-the-top special effects where the threat of a green tentacle monster ends the first act. This could easily be a 70s Doctor Who episode. Thus, the awfully weak plot and outrageously cliqued characters, which would cause Shakespeare to have a double heart attack, works well for this production. The spaceship crash lands on a star where we meet suspicious Dr. Prospero (Jonathan Markwood), who looks as though he has taken a detour to Willy Wonka’s wardrobe, alongside his ‘Virgin and would-be Homecoming Queen’ daughter Miranda (Sarah Scowen). Cue love on deck! The cheesy dialogue manifests into what is the most enjoyable aspect of the show, the music. For example, we have Miranda kissing Cookie the cook of the craft (Mark Newnham), which causes the band to break into Brook Brothers’ Ain’t Gonna Wash for a Week and, of course, there is a cute choreographed routine for Connie Francis’ Robot Man when Miranda compares her crush on the sexist Captain Tempest (Sean Needham) to robot Ariel. This eccentric show may not be to everyone’s tastes, but it is sure to be a highly enjoyable energetic watch for both cult fans and new audiences alike who are searching around the galaxy for a nostalgic night of sci-fi and rock ‘n’ roll music.